My sweetie, Andrew, usually takes the role as dishwasher rather than cook in our kitchen. He rarely cooks, but when he does, its always awesome. I’ve been super busy the last few months and with the increased workload I haven’t been cooking as much as I usually do. In my culinary absence, he’s definitely stepped up his cooking game. This past Sunday, while I was busy with a project, I asked Andrew to run to the store and grab something for dinner. Fully expecting him to return with pasta, I was super excited when came home with sea scallops, asparagus, fresh herbs, meyer lemons, and wine… I have such a great boyfriend. 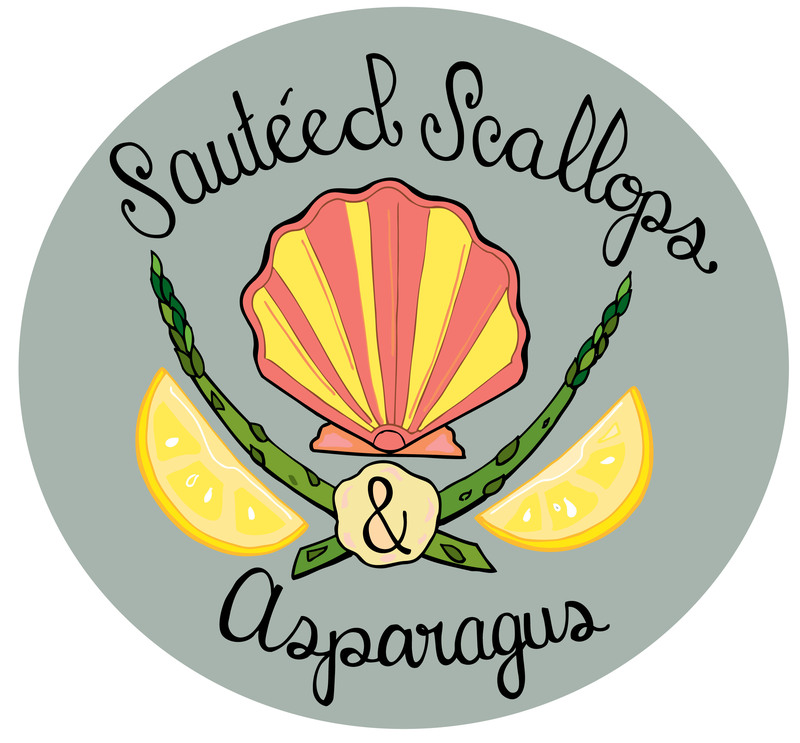 More about the scallops in a minute, I just want to share with you the aforementioned project I’ve been slogging away at this year. I’m doing an Illustrated Bites art show!! I’m super excited to bring Illustrated Bites out of the internet and into the real world. The show is going to be at The Curiosity Shoppe starting April 13. 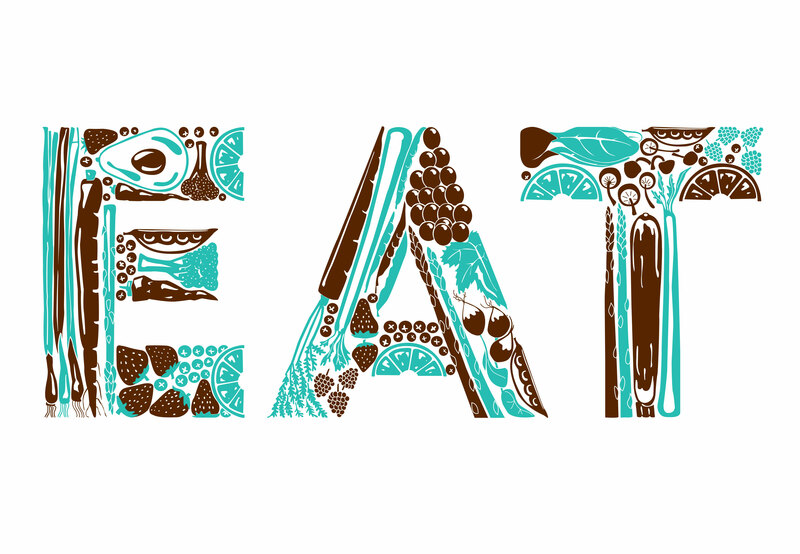 I’m putting my sign painting skills to work to make hand painted recipes and food illustrations. There will also be a little screen printed work and an Illustrated Bites Zine. If you’re in the Bay Area, I would love if you could make it to the opening on Friday, April 13th 6-9PM. If you can’t make it to the opening, the show will be open for 6 weeks. 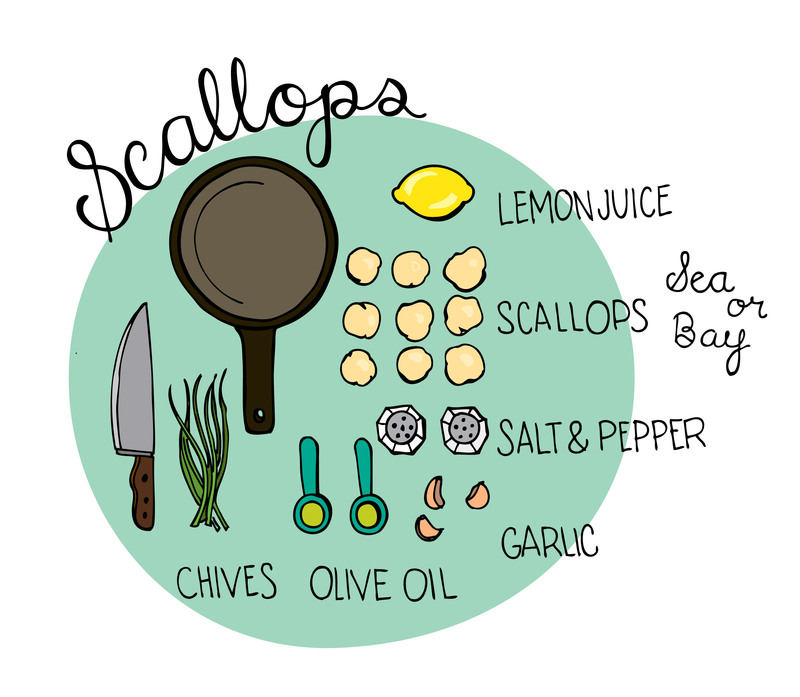 When you’re buying scallops, buy either the larger sea scallops or the smaller bay scallops. Avoid the tiny calico scallops, which are most often too rubbery. Also, try to buy scallops that are “dry,” meaning that they haven’t been soaked in phosphates. This scallop dish is delicious and easy. It pairs nicely with roast asparagus, tied together by the lemon but standing apart in texture and flavor. Both dishes are done in 15 minutes or less. This is a gourmet meal, literally in minutes. So, if you’ve got a hot date you’re trying to impress, but not a ton of time… this would definitely be a good meal to go with. Season them with salt and pepper as they cook and remove them to a bowl as they finish. Return the scallops to the pan, add the chives, and stir to coat the scallop with the sauce. 1.5-2 pounds of asparagus, with ends trimmed off. Place the asparagus in a roasting pan and drizzle with olive oil. Sprinkle with salt. Bake until the thick part of the stalk can be pierced with a knife. About 10 minutes. FUN FACT: Did you know that scallops swim? I didn’t either!! I always imagined scallops just sitting on the sea floor, inactive and passive. Not so! Those little suckers can go. They look like a Mario Brothers character, or a little Pac Man. It’s fun to watch, I can’t get enough of these underwater videos.